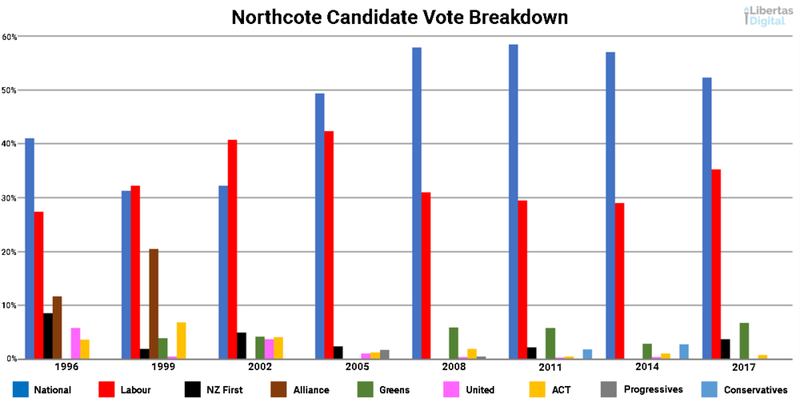 While National has held Northcote since 2005, there's every indication that this time around it could switch hands back to Labour. With the Key/English era of National well and truly over, National faces an uphill battle to retain Northcote. The key to victory in any by-election is maximising turnout by your own supporters. By-elections simply don't attract the same level of turnout as a General Election. In the nine by-elections in the past decade turnout has averaged 58% of what it was at the proceeding General Election. That's a massive drop in voter numbers and illustrates just what a difference a successful get out the vote campaign can do for a by-election. For interests sake the lowest turnout was the Mt Albert non-competition of 2017 where turnout was only 38% of what it had been in 2014, while the highest was Northland's 2015 by-election where 84% of voters from 2014 turned out. This brings us to National's first big hurdle - getting its supporters out to vote. There's a couple of things that could dampen turnout for National. The first is supporters understandable sitting on the fence and waiting to see how National's new leadership team performs and what direction they take National in. After the successful Key/English years this is an entirely reasonable position for supporters to take, as the National Party of 2018 onwards simply can't sit on its laurels and expect warm fuzzy feelings of the Key/English era to carry them forward. Labour was somewhat guilty of that during Goff's leadership, and it's important National learns from that experience. There's no easy way for National to earn that support other than getting runs on the board in terms of holding the Government to account and producing new ambitious policies themselves. The by-election, which seems like to hit shortly after Budget 2018, will make that latter part of the equation difficult, as Labour will have it's big set piece of the year to talk about, and National will need to have a credible alternative in place as well as acknowledging any good points in Labour's Budget. National can't be the "No" opposition party that Labour was for so long. None of this is to say that Simon Bridges and his front bench can't secure that support, I definitely think that they're able to. But securing it within such a short time frame of becoming leader is going to be tough. That being said they've been helped by the Government's ongoing run of bad headlines which is now into its third week thanks to Clare Curran and Jenny Marcroft. The other issue that will hit National in terms of turnout is largely dependent on who their candidate is. Reports today suggest that upwards of 10 people are potentially looking at seeking the Northcote nomination. There's rumours that a few centre-right local board politicians are looking at contesting the nomination, and speculation that there may be at least one possible contender returning from overseas, and a former mayoral candidate putting their names forward too. There's also the rumour that Air New Zealand's CEO Christopher Luxon might seek the nomination. There's merit in either approach - either a local body politician or a high profile candidate like Luxon. A local body politician has the benefit of already being immersed in local issues, and already likely having networks in the local party and community that they can draw on during a campaign. Conversely, a high profile candidate like Luxon could be exactly what National needs to combat the hugely popular appeal of Jacinda Ardern that Labour will undoubtedly use to maximum effect in the by-election. There's also risks in both approaches too. At a local body level the centre-right hasn't exactly covered itself in glory in recent memory with its electoral success. The conflict between competing centre-right tickets didn't help the overall cause in 2016. That failure has been the source of much debate within the National Party about whether the party should set up its own local body ticket to compete with Labour and create a conveyor belt of future MPs too. That's not to say that some of the National Party aligned local body politicians couldn't do a great job as MP for Northcote, but I simply don't know enough about any of them outside of the bigger picture of the 2016 campaign to comment further. The high profile candidate approach from National could also look desperate too. High profile candidates either go one of two ways - be a fantastic success like John Key was, or ultimately end up being cringe-worthy like Don Brash has ended up being for the right (despite his near success in 2005). From what I've seen of Christopher Luxon it seems more likely he'd follow in John Key's footsteps, rather than follow the Brash burn bright but briefly approach. Luxon has had a pretty successful career at Air New Zealand, and would be able to hit the ground running in terms of the media commitments required of candidates, but it's harder to know how he'll relate to voters on the ground and the gruelling ground nature of day-to-day campaigning. He'll have experience dealing with a wide range of people at Air New Zealand, but being a candidate is a world apart from being the CEO of our national carrier. Much like Labour, National should be able to deploy a fairly strong ground team to knock on doors, deliver pamphlets put up hoardings, call voters, and do all the usual campaign 101 things that keep campaigns working. In this regard the Young Nats in Auckland have excelled in recent campaigns of putting in the hard yards. National will also benefit to some extent from Labour and New Zealand First's anti-Asian approach. With Northcote have twice the rate of people identifying as coming from an Asian background that New Zealand, National will be able to use this as an issue to drive people away from voting for the Labour candidate. As much as Labour and New Zealand First will claim their policies are about overseas people, if you read any of the reaction to Labour's "Chinese-sounding surnames" debacle of a couple of years ago you'll know how many Asian-Kiwis coped racial abuse stemming from that. Another challenge for National is that at this point Northcote looks like it might be their first by-election without Steven Joyce, whose reputation as campaign chair is well deserved. How that might play out in terms of what unfolds in Northcote is hard to tell. Joyce, living in Albany, would have been as well placed as anyone to know first-hand what issues would and wouldn't motivate voters in Northcote. If National can get him involved in some sort of advisory capacity it will be a big help for them, though at the same time they do need to start blooding a new generation of campaign managers and campaign chairs to lead the party into the future. 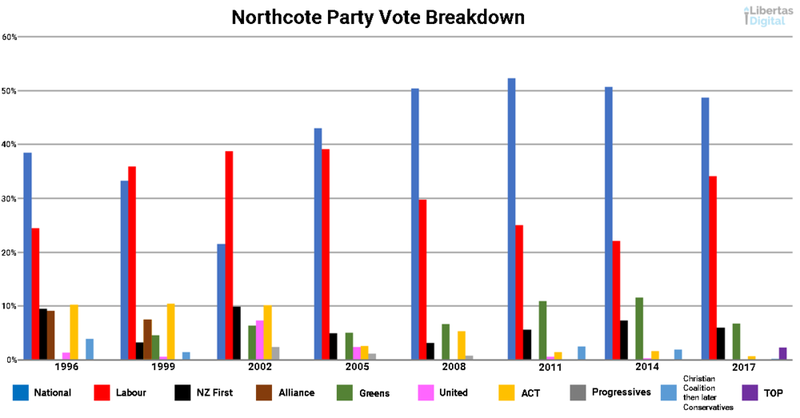 The other issue National faces is that Northcote, as a bellweather seat, has shown a habit of generally voting where the largest party support is. If we went off the 2017 election results National would be a shoo-in for Northcote. However a lot of water has gone under the bridge since then, with Bill English leaving and Simon Bridges taking over. The dampening impact of the end of the Key/English era can't be underestimated, and National will need to work overtime to mitigate that effect alone. Likewise with recent political polls showing Labour's support in the high 40s, and National's lurking around the mid to low 40s, my calculations have National holding a 4.5 to 5.5 percentage point advantage, and that's without taking into account the recent leadership change. National also can't break out the cheque book in quite the same way Labour can with regards to policies. Not only are we two and a half years away from the next election, meaning it's hard to promise things that you can't credibly deliver until virtually a full Parliamentary term away, but National has had a mixed bag with those types of by-election sweeteners in the past. It also doesn't suit National's narrative that it's not just about how much a government spends, but what results they get from that spending. One thing that is in National's favour is that regardless of whether New Zealand First runs a candidate they've probably already bled any potential National supporters from their voters back to National in annoyance over Winston Peters going with Labour. ACT also seems unlikely to take many votes from National in the seat either. While National holds a slight advantage when looking at Northcote historically, the ongoing strong popularity of Jacinda Ardern personally, and National's own leadership change are going to make it a challenging proposition for National to win the seat again. And I say win here quite purposefully. It's not about National retaining Northcote. We're not talking about an incumbent justifying why they should still be MP. We're facing the situation where a brand new candidate needs to win the support of the Northcote community to take up that leadership role for them, and that means winning each and every vote from the ground up. If there's one thing that becoming Leader of the National Party for Simon Bridges has achieved, it's been bringing out the worst in his opposition online. Bridges seems to be, like Jacinda Ardern and Helen Clark for Labour, or John Key for National before him, a figure who provokes the very worst out of some very vocal people. The hot takes on Simon Bridges have oscillated from just plan bad, to completely abhorrent and devoid of any rational thought. Whether it's been people criticising his Westie working class accent - a critique that comes off as little more as snobby elitism - or those mocking his hair style - shall we recall the howls of protest over other politicians being judged on aspects of their physical appearance? - a large portion of the opinions being shared aren't based on any substance about Simon Bridges the politician, but are little more than petty personal attacks against Simon Bridges the person. Perhaps the worst I've seen since the announcement have been from people who should know a damned sight better, that both Simon Bridges and Paula Bennett aren't Māori enough to claim Māori heritage. This absurd like of attack seems to draw on two equally as stupid measures: one being what percentage of Māori ancestry they have, and the other being whether they're either fluent in te reo or able to recite a mihi. What makes these lines of argument absurd, and essentially racist, is that they completely ignore the fact that both Bridges and Bennett's experience of being urban Māori are largely representative of urban Māori in general over the past century. The migration of Māori from rural New Zealand to urban centres over the past century, combined with backwards policies towards Māori culture for much of that time, saw many Māori separated from their cultural identity. Bridges and Bennett are very much part of this wider issue facing urban Māori, in that their disconnect from their cultural heritage has been created by time, geographic, socio-economics, government policy, and circumstances beyond their immediate control. These same factors have also acted as barriers towards urban Māori who seek to reconnect with their culture. It's one part of the reason why the percentage of Māori who speak fluent te reo has been stuck between 20-25%. While that is gradually changing, with more and more urban Māori reconnecting with Tikanga Māori, it's also important to acknowledge that it's not always possible or easy for urban Māori to do this. Judging one's command of either te reo or Tikanga Māori as a an artificial measure of their "Māori-ness" is a perspective which simply holds no merit. Much like the arbitrary standards being demanded by some for knowledge and practicing of te reo and Tikanga Māori, the notion that there's a specific percentage or fraction of ancestry that must be Māori for someone to be able to say they're Māori is an idea I had hoped we had abandoned some 30 or 40 years ago. As I indicated at the start, the plethora of bad takes based on superficial rather than substantive issues directed at Bridges coming from the Left are eerily similar to those directed at Jacinda Ardern from the Right. Whether it's people opining on what Ardern is wearing, her relationship with Clarke Gayford, her pregnancy, or her age, or her media appearances (which are fundamentally no different to those done by John Key) the Right has been guilty of exactly the same behaviour throughout Ardern's career, and even more so since she became first Leader of Labour, and then Prime Minister. Interestingly, Bill English never seemed to attract quite the same level of bizarrely bad or offensive reckons on his personal attributes. Of course, none of this is anything new. The Right and Left both suffered from what's been termed as Clark/Key-Derangement-Syndrome in the past. Yet as both Clark and Key demonstrate, petty personal attacks against politicians achieve nothing. Unfortunately I suspect the people who most need to learn that lesson, those who continue to spout this nonsense, are also the ones least likely to ever change their ways. In part it seems that much of this could be down to social media contributing to an increasingly partisan element to online discussion of politics, and in part giving trolls a platform to spout their nonsense that they've never had before. But it also seems that some leaders tend to polarise opinion about them based on largely on superficial elements rather than substantive issues. Congratulations to Simon Bridges on becoming the new Leader of the National Party. In taking on the role, Bridges also becomes the first Māori to lead either major party in New Zealand, a significant milestone in New Zealand's history that's worth celebrating regardless of where your political loyalties lie. Throughout the leadership campaign Bridges has talked about the need to review and renew National's approach going into the 2020 election, both from strategic and policy perspectives. I've been vocal about the importance of the National Party doing this, as it can't be trying to re-litigate the 2017 election when 2020 rolls around. It needs to celebrate the wins from the Key/English era, but acknowledge the shortcomings and come up with a bold policy vision to address the issues that New Zealand faces. Bridges own approach seems to echo this, with him saying in his first press conference as leader that he'll look to build on the good economic policies of the past-National Government, but address shortcomings in other areas. Since going into opposition Bridges has proven to be a thorn in the Government's side. Winning a battle of Select Committee places by catching the Government out over whether it had the numbers to elect Trevor Mallard Speaker, on the opening day of Parliament, is an example of this. Likewise, Bridges' background as a Crown prosecutor, and having sparred with both Winston Peters in Tauranga, and Jacinda Ardern on national television, means he has form going toe-to-toe with the two central figures of the new Government. Of course being in Opposition is more than just winning Beltway battles. As Bridges himself has alluded to, National has to both hold the Government account, but also look and act like a Government-in-waiting itself. It's a hard balance to achieve, and much of what Bridges will do over the next week ahead of National's Shadow Cabinet reshuffle will be ensuring that he gets that balance right. I look forward to seeing how Simon Bridges takes National forward over the coming weeks. Before midday on Tuesday we should know who the new Leader and Deputy Leader of the National Party are. Within a week or so we'll also have seen the resulting Shadow Cabinet reshuffle. The five leadership candidates would all bring their own set of strengths and weaknesses to the role. Given I've worked with most of them in the past, I'm not going to traverse these, but there has been some good (and some not so good) analysis out there, so feel free to google away. What seems readily apparent is that each of the candidates would, to varying degrees, look to change the direction and strategy of the National Party heading into 2020. I'm firmly of the belief that this is a good thing. National can't spend the next two and a half years fighting the 2017 election campaign over and over again. Labour made that mistake in 2011 and then fought a quasi-civil war for the next six years as it tried to move on from the Helen Clark era, contorting itself into a host of contradictory policy positions along the way. It's a legacy that still plagues them today, as demonstrated by their newfound enthusiasm for the CPTPP despite it essentially being the same deal as the TPP they so vehemently opposed. The pace of that transition is important too. If National moves too quickly away from the Key/English era they run the risk of leaving behind the very supporters who delivered National such a large share of the party vote. Move too slowly and National will find itself responding to initiatives the Labour-led Government is proposing, rather than leading the conversation on New Zealand's direction and solution to our issues themselves. That last part is crucial. National knows better than anyone about how fruitless it is to go after Prime Minister Jacinda Ardern directly. It watched as Labour smacked its collective head fruitlessly against the edifice of John Key's enduring popularity for eight years, and they know that a similar approach against Ardern won't deliver results. As to whether National needs to create or foster its own support parties for 2020, I've decided that it's presumptive to assume that new parties won't appear on their own. Looking back over New Zealand's electoral history, you would have been hard pressed to find anyone who predicted, only a handful of months into the first term of a new government, the formation of any of the minor parties that have existed. In 1984 nobody would have picked that Jim Anderton would head off and create his own political party, likewise for Winston Peters when National took the Government benches in 1990, or the emergence of the Māori Party from Labour. Notably, with the exception of the Greens breaking off from the Alliance between 1997 and 1999, minor parties generally get created from MPs occupying the government benches. Meaning that if a new minor party is likely to appear, it's more likely to be from Labour, the Greens, or NZ First, than it is from National. Time and time again minor parties have been created by events unforeseen by political journalists or commentators at the start of a term. There's still every possibility that a new minor party could emerge organically, whether propelled into existence by a policy issue or a personality clash. National needn't risk its own voter base, or open itself up to claims that it's falling apart, by trying to foster or split up to create its own minor party partner. A far more useful strategy is to pressure the parties of Government so they can deliver that potential partner party for them. When I hear the latest buzzword "generational change" being bandied about to describe politicians, it makes me cringe. There's almost a element of ageism about the term. It's as if somehow people who don't represent generational change (a term largely based on age rather than anything more meaningful such as values or policies) are less valuable to society, or have less to contribute to our political discourse. The reality is that New Zealand, like most other Western democracies, has an aging population, a fact which gets amplified through voting patterns. In the 2017 election some 51% of voters were over 50-years-old. The median age of the voting public also greyed - increasing from 47 in 2014 to 48 in 2017. In fact, the share of the voting public in the age bracket that seems to be most associated with generational change - MPs aged between 35 and 44 shrunk at the last election. While there was an increase in the share of votes coming from those aged 18 - 34, it was offset by growth at the older end of the spectrum. Factoring into this too is that the median age of New Zealand's population is rapidly increasing, sitting at 37 in 2016. It's likely to likely to hit 40 by the early 2030s, and could accelerate further due to a falling fertility rate. Throw in analysis around how each of the parties performed for the party vote in each age bracket (remember that this is a fairly broad analysis, so is indicative rather than gospel), and the whole idea of generational change for generational change's sake is a tad nonsensical. There's a very large pool of voters (and I mean people who go and actually participate in elections by casting votes) who aren't representative of generational change at all. Ignoring or discounting the importance of those voters who emphasising or overstating an apparent need for generational change is done at your own peril. How do you think Winston Peters has managed to claw out an ongoing niche for himself over the years? I'm not suggesting that National should go down the route of emulating Winston Peters. But they have to be mindful of not turning their back on older voters. If those voters perceive National doesn't care about them anymore, there's really only one place for them to go, and that's to Winston, and that doesn't help National's cause at all. There are generational policy challenges ahead. Issues like climate change and the housing crisis require long-term thinking. Yet the age of a party's leader and a claim to represent generational change in leadership in itself does not qualify one to be any better equipped to deal with those challenges than their gender, marital or familial status, sexual orientation, or their accent. What matters more is whether their values match enough of the electorate, whether their policies can deliver outcomes that benefit enough voters and, not least of all, whether their personal style engenders confidence that they understand people's concerns and a sense of trust that they will address them. Age, and by extension generational change, in itself does not provide politicians with a monopoly on these things. The world is far more complicated than that. Ultimately, leaders are meant to lead for all New Zealanders, not just lead for one generation over another. There are old conservatives, there are young conservatives. There are old liberals, there are young liberals. Judge a leader's suitability on their values, their policies, their personality and style, but not their age and whether it symbolises generational change. To help everyone keep track of everything that's going on with National's leadership race, I thought I'd throw together a tracker so we can see who's running and which MPs are backing them. At this stage I've included both Mark Mitchell and Steven Joyce in the race, even though neither have made a declaration about whether they're in or out at the time of writing. I figured it'd be easier to include them now and remove them later than the other way around. I've listed them in order of announcing, with Mark Mitchell and Steven Joyce alphabetically by first names. There's 28 blue bars as they need 29 to win, but obviously their own vote is the finishing line. I'll endeavour to keep this up-to-date based on publicly available endorsements, of which I'm only aware of four in favour of Amy Adams. If they don't run it'll mean I don't have to have all those words awkwardly on the left like that. The fun of optimising graphics to display in link snippets on social media platforms! 20 February, 8am: Steven Joyce announced he's in the leadership race on RNZ's Morning Report. 19 February, 2.40pm: Mark Mitchell has now announced that he's running for leader. Says he's had strong support, was approached three weeks ago to consider standing in the event of Bill English resigning. 19 February, 12.55pm: It's been a bit quiet over the weekend. But Mark Mitchell is poised to make an announcement at 2.30pm in Orewa. Still no word from Steven Joyce. We've put together a MP Endorsement Tracker to keep up with any public endorsements from MPs for a specific candidate. We appreciate there's a lot of speculation about how many votes each candidate might have behind the scenes, but we're no really able to count those. 15 February, 3.40pm: Jonathan Coleman has ruled himself out of the leadership race. 14 February, 11am: Simon Bridges has announced he's running for leader. 14 February, 10:30am: Correction: RNZ only say that Mark Mitchell had confirmed he's considering making a bid, but only after he's visited his daughter in Australia. I misread their tweet! 14 February, 9.45am: Newstalk ZB has Steven Joyce saying he's considering options on running for the leadership. Over the coming days I'll try to put together a quick graphic as and when news breaks about who's in and who's out of the National Party's leadership contest. I'll endeavour to update it as and when announcements are made, though I'm still recovering from a nasty illness and injury so will be entirely dependent on whether I'm able to get out of bed. The above is based on publicly reported statements that I've seen on Twitter. Where an MP hasn't yet made any statement (e.g. Amy Adams hasn't said anything at all on the race) I've opted to not include them in any of the boxes. 2018 will be a tricky year for National, with the Labour-led government still benefitting from a new car smell, and being able to formally launch a raft of signature policies, especially over the first half of the year. So what's in store for the blue team in 2018? National kicked off the 2018 political year early, with Transport spokesperson Judith Collins launching a series of petitions designed to put the government under pressure to regarding a raft of roading projects that had been proposed under National. This was followed by Nikki Kaye launching another petition calling on the government to resource schools so that primary and intermediate aged school children had access to be taught a second language. Politically they're both useful strategies. Many of the roading projects being fought for via the petitions enjoy significant support at the electorate level, and Nikki Kaye's second language petition stems from a policy idea National launched in election 2017 that was very warmly received. I suspect much of National's approach in 2018 will look similar to what we've seen over the past couple of weeks. That means that on the one hand National will look to a piece of Key/English era policy that's under threat and use a potential threat to it as a way to attack the new government, but at the same time they'll promote a new, innovative policy in a different area. It's a strategy that will allow National to both stand up to protect their own record in government, as well as move their policy platform forward for 2020. Remember too that petitions aren't just about promoting a policy or pressuring the government on a given issue, they're also an important tool to bolster email lists and inform voter ID databases. Expect a steady stream of these throughout 2018. The big question that will hover over National throughout 2018 is whether Bill English will stay or go. English indicated after the election that he intended to stay on to contest 2020 as leader, and the reality is that should he want to, and National's poll numbers continue to hold up, there's every chance he could do that. Bill English is immensely well respected and liked within the National Party, and unless National's polling drops below 40%, it's unlikely there will be any moves to challenge him. In the event that English decides to leave, or the poll numbers drop off, I'd expect any leadership transition to take place in the second half of the year, possibly around June to August. In part, this is because the new government should, off the back of a busy first half of the year, hit its best poll numbers as a result of the Budget, meaning that post-Budget could be when Bill English decides to call stumps on what's been a long and dedicated career of public service. Likewise, from that point forward, the strengths that English would trade on versus the government - the experience of him and his team - will deliver diminishing returns as more water goes under the government's bridge as their team builds on their own experience and irons out any teething problems. Much of National's ability to reinvent themselves going into 2020 may well rest on what English does. If English does decide to leave, along with the leadership contest, it will likely trigger a few other departures too. List MPs like David Carter, Chris Finlayson, and Nicky Wagner may well announce their departures soon after, while a slew of electorate MPs such as Gerry Brownlee, Anne Tolley, Ian McKelvie, and Nick Smith, will likely wait until late 2019 or early 2020 to announce they won't be standing again. I'd be genuinely surprised if any of the National electorate MPs leave mid-term and trigger a by-election, unless they happen to stand for a local body role in 2019. Paula Bennett: Currently Deputy Leader, and former Deputy Prime Minister, Bennett is generally well liked throughout the party. Much like John Key, she not only has a compelling backstory, but she does tend to polarise opinion outside the party, with people either loving or hating her. Bennett's personal "westie" brand would offer an interesting contrast with the more inner city urban charisma of Jacinda Ardern. Simon Bridges: National's Leader of the House, Bridges has long been talked about as a future leader of the party. Respected throughout the party, Bridges occupies a special place in National for having nearly snuffed out New Zealand First by beating Winston Peters in Tauranga in 2008. Bridges also has experience going one-on-one versus Ardern, having both been part of TVNZ's political "Young Guns" panel on Breakfast. Nikki Kaye: The Auckland Central MP and former Education Minister has one thing that no other candidate has - she's beaten Jacinda Ardern not once, but twice in Auckland Central, a seat that demographically could be a strong Labour seat. Kaye has also won plaudits both for a formidable work ethic, as well as bringing a fresh and innovative approach to her portfolio areas. While Nikki Kaye has recently ruled out running to be leader if Bill English leaves, I don't think anyone should read too much into that denial. Amy Adams: With her background and links to rural New Zealand, Adams offers an opportunity for National to go after New Zealand First in provincial New Zealand. On top of that, Adams also has a strong grasp of policy and a well respected record during her tenure as a Minister. Adams also kept her powder dry during the post-Key leadership contest. Jonathan Coleman: Following John Key's resignation, the then Health Minister pitched himself as someone who could refresh National's approach. There's no reason to think that Coleman's ambition has diminished since going into opposition, and his hand may very well be strengthened in a post-English world. Outside possibilities include Judith Collins, who challenged for the leadership in December 2016, as well as Steven Joyce who has refused to speculate on any ambition to be leader of the party. Whatever happens with National's leadership, there is a need to use 2018 to make the switch from the traditional combative role of opposition to being an opposition that leads the conversation on policy issues. The usual attack-based approach to opposition didn't work for either Labour or National during their spells in the wilderness in the past two decades, and it was only largely when both parties moved away from that approach that they started to enjoy electorate success. This will be a challenge for National, because as much as they need to make this switch going into 2020, it's also important that they're not seen to turn their backs too quickly on the Key/English era. A leadership change would make this easier, but it is still possible if English decides to stay on to contest the 2020 election. National will still need to, as much as possible, hold the government to account, keep the feet of poorly performing or struggling government ministers to the fire, poke and prod at policy and personality tension points between Labour, New Zealand First, and the Greens, and ensure that they make their voices heard at Parliament. But now is the time to get their ducks in a row for 2020. On the Commission Opening of Parliament the Leader of the House has one simple job - make sure you have the numbers to elect a Speaker. Today the new Leader of the House Chris Hipkins failed to do just that. With at least five Labour, NZ First, and Green Party MPs away and one National Party MP, Labour wasn't confident if it would have had the numbers in the House to elect Trevor Mallard as Speaker. If Hipkins was doing his job properly he would have realised that he didn't have the numbers before the Commission Opening, and would have approached National's Leader of the House, Simon Bridges, and done a deal before it came to a head on the floor of the House. The onus is on the Government to ensure it has the numbers to ensure confidence, pass legislation, elect a Speaker, and so on. You can't fault the Opposition for picking up on Labour potentially not having the numbers and forcing the issue. The net result for Labour is that they've been forced into an embarrassing back down over Select Committee numbers. Nothing short of an omnishambles from the Government on its first day in the House. It appears as if Labour fell for a spectacular bluff on National's part. Labour did actually have the numbers 58 to 56, however ended up negotiating on Select Committee numbers to ensure that Trevor Mallard's nomination as Speaker didn't end up going to a vote. As a result, there are now 108 Select Committee places, with National receiving 5 chairs and 5 deputy chairs. Leader of the House Chris Hipkins and Prime Minister Jacinda Ardern emerged nearly four hours after Labour's shambolic performance in the House to try and spin their way out of it. Hipkins claimed that they knew they had the numbers, but wanted Mallard to be elected unopposed to show he had the confidence of the House (ignoring the fact that in the past opposition parties have voted against Speakers), and also that they had let National know previous that Labour wouldn't oppose a nomination, and had hoped National would do the same. Problem with Hipkins' claims are this: there's no onus on the opposition to ever vote with the Government on anything. Your base operating position should also be that if you haven't heard anything to the contrary, you always assume the opposition will not support whatever it is you're putting to the House. Fun and games in the House by oppositions are nothing new. Last term I remember some urgent legislation that Nick Smith put to the House. As it was an omnibus bill being passed under urgency, it meant that the then opposition could keep putting up amendments which the then Government would then have to vote down. Even though the opposition parties knew all their amendments would be voted down, they still did it because they had been given the opportunity to do so. What is far more likely is that Hipkins and Labour's leadership team were completely unprepared for some basic House manoeuvring, didn't realise their bluff was being called, and ended up caving on Select Committee numbers which they had, up until now, been firmly entrenched on. While this whole botch-up by Labour is little more than a Beltway sideshow, it's still hugely embarrassing for Labour. They know that one of their key weaknesses this term will be avoiding getting stuck in the narrative that they're unable to manage their two divergent partners in NZ First and the Greens. Today's omnishambles did little to dispel that. With polls showing Winston Peters (well New Zealand First, but let's be honest, Winston calls all the shots) will hold the balance of power after the election, trying to predict which way he'll jump has become a national sport for political commentators. I've been thinking a lot about this question over the past week, and I've come to conclusion that Winston Peters will pick Labour as a coalition partner, supported by the Greens in a confidence and supply agreement, over National. Back in 1996 pundits guessed Peters would go with Labour, rather than National, as that was where much of his support from the Māori seats had come from. Instead Peters surprised everyone and opted to support National's third term. This decision would almost prove disastrous for New Zealand First, as in 1998 the party split in two and in 1999 it's party vote collapsed to 4.26% (having hit 13.35% in 1996), only being saved by Winston Peters winning Tauranga by a extremely narrow margin of 63 votes. Again in 2005 Winston Peters surprised people by going with Labour over National or sitting on the cross-benches bartering with whoever formed the minority government. National was considered a likely fit largely because many thought New Zealand First's policy platform was relatively similar to that promoted by then National Party leader Don Brash. The cross-benches approach was also one Winston Peters himself had promoted in a speech in the lead-up to the election, saying he wasn't interested in the baubles of office. However once again in 2008 New Zealand First's support collapses after the party was caught up in two scandals during Helen Clark's Labour government's third term. Having polled at 5.7% in 2005 and Winston Peters narrowly losing Tauranga, in 2008 they fell to 4.07% and Peters was trounced with National's Simon Bridges winning twice as many votes as him in Tauranga. This is the crux of why I think Winston Peters will, if he holds the balance of power, pick Labour over National. Twice he's supported a third term government and both times it's nearly spelled the end of New Zealand First. At 72, Peters will know that he's eventually going to have to hand over the reigns of the party to a successor, and he'll want that person to enjoy electoral success as one last middle fingered salute to all the nay-sayers (like me) who say that New Zealand First is a personality party based solely around him. Having twice been nearly annihilated at the ballot box by supporting third term governments and getting caught up in a mood for change, Peters will be eager to avoid that happening again by and so won't support a fourth term National-led government. Instead, much like in 1996 where it was suggested by Michael Laws that Peters was always going to support National and used the threat of going with Labour as a way to get more policy and ministerial concessions out of National, Peters will use that same threat as a way to get concessions out of Labour. He'll also doubly know that a first term Labour-led government is less likely to do damage to the long term electoral prospects of New Zealand First following his eventual departure, as first term governments generally play it relatively safe with the policies they implement. The real trick for National is, if it finds itself in this position after the election, to ensure that the price that Peters extracts from Labour is such that it undermines the credibility of both Winston Peters, Jacinda Ardern, and the Labour Party.